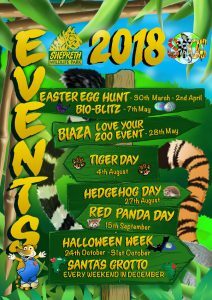 Come along to one of our events such as the Tiger Day, Hedgehog Day, Red Panda Day or Halloween – have fun and support wildlife conservation at the same time. Most events are held at Shepreth Wildlife Park. Normal admission fee applies to all events with all proceeds going to SWCC projects. (Note Tesco Vouchers for entry into the wildlife park cannot be accepted on these days).